If you display the U.S. Flag or a State Flag, then you know that with time it wears out. 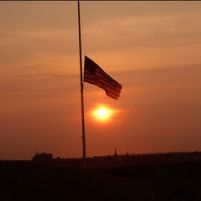 The wind will eventually cause damage, the sun will fade the flag, and sometimes just time itself will cause the flag to come into a status where it no longer should be used. When this happens, many people have heard that the retirement of a flag has established rules. In many cases, the flag is put on a shelf and replaced with a new flag instead of having a retirement for the flag. While everyone may not know the established rules to retire a flag, on Saturday, January 5 a Flag Retirement Ceremony will be held in Fouke, Arkansas at the Fouke Veterans Memorial Park. The event will start at 2 p.m. and will allow anyone from the community to bring worn, faded or damaged U.S. Flags for a free, and proper retirement. While the focus of the event is the national flag, the organizers say that state flags will also be retired properly at the event, and they are offering this service. Ronnie Dancer, Sr., a local Fouke resident and veteran, said that he and a group of veterans from the area wanted to do something to allow people to retire flags appropriately. He said that Home Depot and Walmart had already given flags to be retired to the group and that the community is encouraged to bring flags which need to be retired. The Walmart Neighborhood Market in Wake Village provided three flags for retirement. Ronnie also stated that active military in the area, and veterans in the area are encouraged to attend and participate in the event. The event is being hosted by the Major John B. Burton S.C.V. Camp #1664 of Texarkana, Arkansas. The group and veterans in the area hope to make the event an annual one to allow community members to retire their state and national flags appropriately and according to the established standards in one place yearly. Ronnie Dancer stressed that all flags will be treated with respect, dignity and retired according to appropriate and established rules and regulations. Since the breaking news of Coach Ricky Barker’s public intoxication arrest, various opinions have been circulating on social media. Some people have come right out and said that he should be fired, but in Fouke there also is a growing group of supporters for the coach. That growing support seems to be based on the positive impact that Barker has had on the community and students. Several people have made positive statements such as “people make mistakes” and “shouldn’t we forgive” or “nobody is perfect”. Others have gone as far as to say that what the coach did may have been wrong, but that it is certainly no reason to fire him. One Fouke resident said, “Had the coach been driving with a bus full of kids and was drinking, then heck yeah he should be fired. But he wasn’t.” Along with the positive and negative discussion, there is even talk about a potential meeting at the school to discuss the issue. Some people have suggested that the football team will line the roads and show support for the coach when there is a meeting. Others have suggested that they will testify on the coach’s behalf. One parent noted that his kid was going nowhere and had some major issues before Coach Barker came along. The parent went on to say that Barker started working with the young man and that behaviors, attitudes and in fact the young man’s entire life turned around for the positive. That parent said, “Nobody can take away how much it means to us that Coach Barker helped our son.” Whether the football team and students show up to support Coach Barker will be unclear until there is a meeting. Many residents have stated support already on social media for the coach and have also stated an intent to be at the any planned meetings. There is currently a rumor that when there is a meeting it may be closed. At this time there has been no official posting from the school regarding a meeting. Signs have been showing up on Facebook with one citizen making the sign posted above reminding people of the need for forgiveness. At the time of this article, the sign above was posted on the "Miller County, AR Alerts and crime awareness" page had over twenty-six comments with people still commenting when we checked.